While the pastry is thawing, heat the oven to 400°F. Unfold the pastry sheet on a lightly floured surface. Cut the pastry sheet into 3 strips along the fold marks. Cut each strip into 6 rectangles, making 18 in all. Place the pastry rectangles onto a baking sheet. Bake for 15 minutes or until the pastries are golden brown. Remove the pastries from the baking sheet and let cool on a wire rack for 10 minutes. Split the pastries into 2 layers, making 36 in all. Heat the butter in a 10-inch skillet over medium heat. Add the mushrooms and zucchini and cook until tender and the liquid is evaporated. Season to taste. Stir in the basil. Place 18 bottom pastry layers onto a baking sheet. 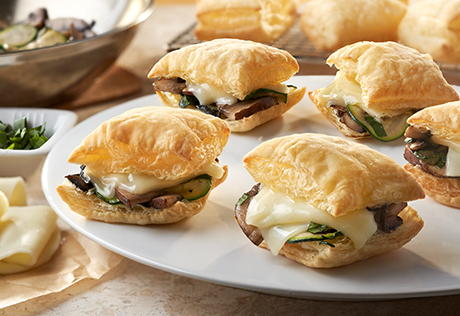 Divide the mushroom-zucchini mixture among the bottom pastry layers. Top with the cheese and top pastry layers. Bake for 5 minutes or until cheese is melted.